Savory Kitchen Table: TROPICAL YUM! 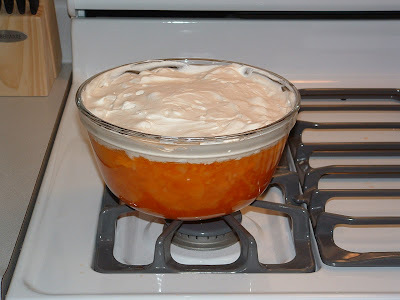 I found this awesome new jello salad recipe over at Mennonite Girls Can Cook called Special Salad. This will quickly become a new family favorite! We have even given it a new name and a few changes. Mix the two boxes of jello powder together in a large glass mixing bowl and stir in 1 1/2 cups of boiling water. Mix well until jello has dissolved. Add 2 cups of cold water. Place mixture in the refrigerator until partially set. 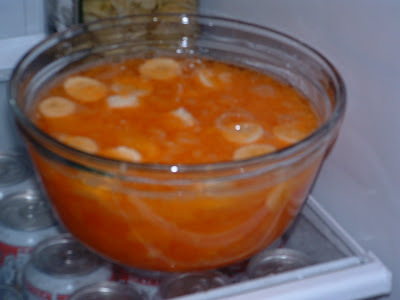 Mix together the orange segments, pineapple and banana slices. Fold into the partially set jello. Whip together the whipping cream, 1 tablespoon sugar and vanilla until thick, cover and place in fridge. Stir 1/2 cup sugar, *1 cup pineapple juice, egg and four together in a microwavable bowl and heat for 1 minute at a time, stirring between until mixture is thick (2-3 minutes) or you can also cook this on the stove top, stirring constantly. Cool this mixture completely and then fold in the whipped cream mixture. Spread over the marshmallow mixture. 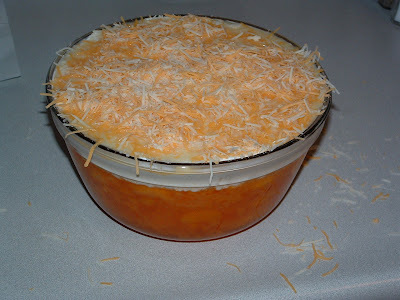 Layer the 3/4 cup of cheddar cheese on the top. Return to the refrigerator and chill thoroughly.